A data centre that is flexible, reliable and cost-efficient is essential for supporting business growth initiatives. Keeping your business needs in mind, Lenovo offers servers designed with meaningful innovations. Lenovo™ servers, powered by Intel® Xeon® processors, are built to industry standards so they integrate easily into your existing IT infrastructure. They are also ranked #1 in x86 server reliability, as per the ITIC Global Reliability Report1. Additionally, our partnerships with industry leaders provide you with choice, eliminating vendor lock-in. Build a foundation that gives you the flexibility to set higher business goals. Data centres should make life easier, not add a layer of complication. Lenovo offers highly flexible and easily integrated solutions. Increasing your data centre's productivity means simplifying your IT systems whilst increasing security. Discover Lenovo today. You have many choices when choosing servers for your data center. The Lenovo X6 servers have many advantages over alternate servers from pure feature capabilities, consolidation and solution advantages. Lenovo Storage brings you the products you need, the choice you desire, the ease of implementation you require and the low price points to fit your IT budget. How are things shaping up for the datacentre industry in the year ahead? Tikiri Wanduragala, Lenovo’s EMEA x86 Server Systems Snr. Consultant, gives ThinkFWD the inside line. Lenovo XClarity Administrator is available as an option on System x and selected ThinkServer offerings. Predictive Failure Analysis is available on Lenovo System x servers. Light Path Diagnostics is available on Lenovo System x servers. In today's competitive business environment a reliable infrastructure is crucial for success. Server uptime directly impacts revenue and responsiveness to customers. More companies are demanding 99.99% uptime and many IT managers spend 25% of their time reacting to technical issues2. Gain strategic business advantage with maximum server uptime from Lenovo. Per the ITIC 2015–2016 Server and OS Reliability Survey, July 2015. A 79% majority of corporations now require a minimum of 99.99% uptime or better for mission critical hardware, operating systems and main line of business (LOB) applications, up from 67% in 2012–2013. ITIC Report 2014. IT departments claim to spend 25% of their time reacting to technical issues - Lenovo Commercial Segmentation Study, June 2015. According to TBR analyst report, released in August 2015, Lenovo was rated #1 in all 22 of the evaluated attributes. Lenovo XClarity Administrator is available on System x3650 M5, System x3550 M5 and System x3500 M5. Innovation in the data centre is only relevant if it answers your needs. Lenovo systems integrate meaningful innovations to give you a data centre built for growth, speed and efficiency. Easy Integration: Lenovo systems are built on open industry standards for easy integration into your existing infrastructure. Quality: We’ve been voted #1 for our commitment to quality by customers responding to the Technology Business Review Customer Satisfaction Study1. Reliability: Lenovo systems are rated #1 in x86 server reliability, as per the ITIC Global Reliability Report2. Performance: Our systems have a long history of industry leading performance achieving over one hundred #1 benchmarks. Security: Our systems are designed with security features. We own our manufacturing facilities and have a trusted supply chain. Service and Support: From 24/7 technical support and extended warranty options, to factory integration and deployment services, we provide a complete suite of data center services to support the full lifecycle of your investments. Supply Chain: We have a secure, high quality and high velocity supply chain. In fact, Gartner ranks Lenovo #18 in the world among the top 25 supply chains3. Lenovo™ systems, powered by Intel® Xeon® processors, can turn your data centre into a business growth engine. We innovate so you gain competitive advantage. Lenovo's innovations in seven key areas have transformed data centres forever. We excel in quality, reliability, performance, security, easy integration, service and support and managing supply chains. Lenovo is everything your business needs. TBR 4Q15 Corporate IT Buying Behavior & Customer Satisfaction Study: x86-based Servers, Jan 2016. The Gartner Supply Chain Top 25 for 2015: http://www.gartner.com/technology/supply-chain/top25.jsp. 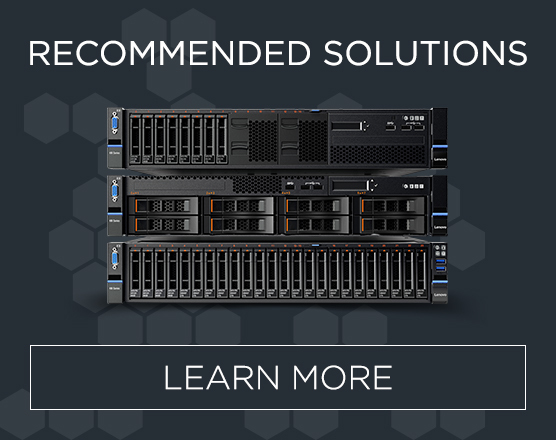 Accelerate deployment, maximize resources and reduce costs with the Lenovo Converged HX Series. In business, competitive advantage is directly connected to the capabilities of your IT. Optimize efficiencies across your data centre with Lenovo Converged HX Series, designed for the industry-leading Nutanix™ software. Lenovo™ hyper-converged solutions, powered by Intel® Xeon® processors, consolidate storage, computing and virtualization in a single appliance. This integrated approach allows you to accelerate time-to-value while reducing IT complexity and costs. Simplify IT deployment and management – Pool your resources into a single virtual structure for more efficient utilization and management. Scale up and scale out easily – Add more nodes to the cluster depending on your specific requirements. Accelerate time to value – Deploy business applications faster by speeding procurement, installation, configuration, management, upgrades and expansion of your IT infrastructure. IDC estimates hyper-converged appliances typically deploy in less than 2 hours, as opposed to weeks with traditional IT hardware1. Reduce costs and improve ROI – Adopt a ‘pay-as-you-grow’ model to add new appliances only when more capacity is needed. Integrate seamlessly to your current virtualization hypervisors – Choose from VMware ESXi, the built-in Nutanix Acropolis hypervisor or Microsoft Hyper-V hypervisor. Lenovo also offers a simple, straightforward warranty and support through a single point of contact. Lenovo hyperconverged solutions enable the next level of IT efficiency to take your business forward. Hyper converged infrastructure involves integrating storage, compute and virtualisation technologies. The core benefit being a reduction in overheads and the freeing up of IT departments to work on strategic, rather than day-to-day challenges. Tikiri Wanduragala, Lenovo’s EMEA x86 Server Systems Snr. Consultant, writes for ThinkFWD on software-defined and hyper-convergence – two of technology’s hottest topics. Download our workload solution brochures to learn more. Lenovo has partnered with some of the industry leaders including Nutanix, Redhat, Citrix, DataCore, VMware and SAP Hana to provide workload solutions that can transform global businesses. We offer cost-effective solutions that simplify IT architecture and drive business transformations with powerful automation, agility and flexibility in their IT infrastructure. With a focus on competitive value and ease of doing business, our Intel® Xeon® processor powered hardware and software solutions enable easy deployment and management of physical, virtual and hybrid cloud environments while driving down the cost curve. Download the workload solution brochures for further information or speak to us today. Lenovo server technology can help innovation across your organisation. Discover tips on how to pull together the right business case to migrate mission-critical systems to newer technologies. Key trends driving the digital economy include hyper-connectivity, supercomputing, cloud computing, big data, mobility and cyber-security. A revolution is under way in business and government. Lenovo presents innovations that enable data centre growth, speed and efficiency. Watch our innovations video series to see how Lenovo’s solutions were recognised as #1 in overall customer satisfaction in the ‘Technology Business Review Customer Satisfaction Study’1. Does your data centre drive business growth? Lenovo presents innovations that help businesses become faster and more efficient. The Lenovo servers were ranked #1 in x86 server reliability in the ITIC 2015 - 2016 Global Reliability Report. Lenovo believes the data centre is the engine that drives business growth. Our heritage of innovation helps us provide you with critical advantages to transform your data centre. The Lenovo servers have a long history of industry-leading performance to enable the most demanding applications. At Lenovo, security of our systems is essential. That’s why we employ rigorous processes, innovative product designs and supply chain controls to ensure our products meet stringent requirements. The Lenovo™ servers are built on open industry standards for easy integration into your existing infrastructure. #1 in x86 server reliability, per the ITIC 2015-2016 Server and OS Reliability Survey, July 2015. ServersRacks, towers, blades, high-density, & mission-critical servers and options. storageEasy to manage, simple to scale, always available. DAS, NAS, SAN, & tape storage for the enterprise. NetworkingTop-of-rack & embedded blade modules, software, & more. Fast & agile networking for IT efficiency. softwareSystem-management, operating systems, & more for the dynamic business. solutionsOptimised starting points for customising your solution & accelerating business advantage. servicesProfessional training solutions, warranty info, & more. See what different can do for you. 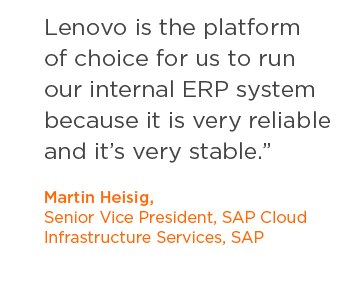 SAP relies on Lenovo System x servers, to run real-time analytics and develop next-generation cloud applications for its customers. 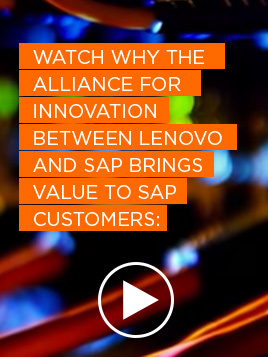 Optimized for the specialized requirements of SAP HANA®, Lenovo System x servers, powered by Intel® Xeon® processors, are the result of a 10-year partnership for innovation between Lenovo and SAP. Learn More about how Lenovo can help your business with getting the most out of your "Big Data".